Inaccessible PDF files due to corruption? Searching for recovery solution to remove corruption errors? PDF File Recovery tool works towards extracting all recoverable data components of corrupted PDF document. 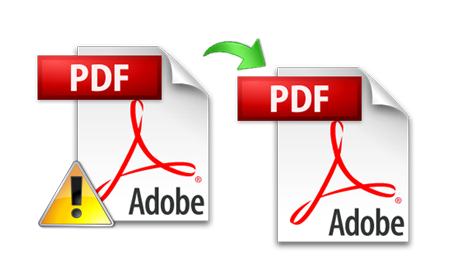 Text and also images from PDF files can be recovered with the help of this tool. The tool helps removing errors from the PDF files that occurs due to corruption issues. It helps in removing lower and also higher level of corruption issues from files. The tool is well versed with advanced program algorithms that help restoring PDF data into its original format while maintaining its integrity and actual structure. The tool saves recovered data into new files and performs read-only execution on original PDF files. This way, the data incorporated within the original files remains unaltered. The tool supports all the formats and the versions of PDF files including v1.7. The resultant files can be accessed in any version of the PDF viewer tools and utilities. PDF Recovery Tool is Windows based and works well over all available versions of the respective Operating System including 8.1 and lower release. Demo version of PDF File Recovery software is available to test the workability and functionality of all the available options and also operational features. But this version comes with restricted usage; it allows recovery as well as previewing incorporated data within the tool panel. However, it does not allow exporting file to local storage device. This very limitation can be eradicated by purchasing the licensed version of the tool which will allow you to recover data from PDF documents within a limit. The full version can be acquired by contacting the Technical Support team which is available for all time assistance related to the product. Does PDF Recovery Tool helps in removing PDF corruption errors? Yes, the tool helps removing errors that occurred due to corruption in PDF files. Which version of Windows OS does the tool compatible with? The tool works upon Windows 8.1 and all lower versions. Does the tool perform recovery on multiple PDF documents? No, the tool recovers PDF documents on one-by-one basis. However, it is possible to recover limitless files with the use of licensed copy of the software. What kind of PDF files does the tool supports? It supports all the available version of PDF including 1.7 and lower versions. Does the tool allow recovery of images existing within the corrupted file? Yes, it enables recovering text as well as graphics and images from the PDF files. "My priority was to recover corrupt PDF document as it holds necessary information. I tried my best for making the file accessible but the workarounds did not prove to be helpful. Then I tried this PDF Recovery software, and it helped me gaining access to all existing data." "I need to recover PDF file and want to restore data within its original format. This recovery tool enabled me to recover my document as well as helped me to restore data while maintaining its integrity and actual layout." "I got some corrupted PDF files (version not known). I was in search for the recovery software that can handle all sorts of corruption as well as all the versions of the file. The recovery tool allows me to recover data from PDF files since it supports all available versions of the given file format." "Before investing upon the PDF File Recovery, I tried its demo version that is available online. Its performance and workability was up to mark and it enables me previewing recovered data right from the tool panel. Later, I purchased its licensed version to deal with corrupted PDF files."